Now this is how I like to see in a New Year! I poured myself into a fancy frock (actually I tell a lie – it was more like winched) and headed to the lovely Sir Charles Napier restaurant near Chinnor, Oxfordshire, for NYE with friends. 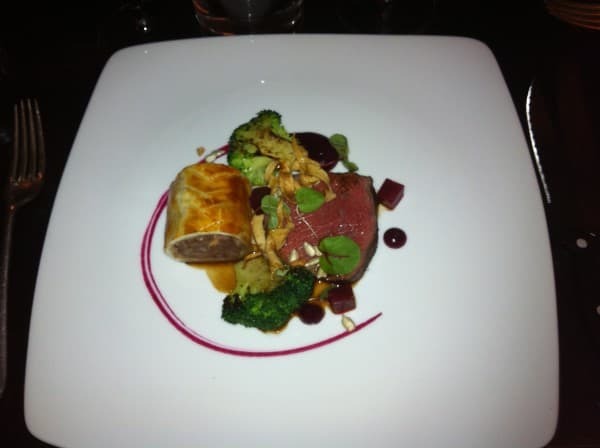 It recently retained its Michelin star for the second year, but deserves a constellation for presentation for this main course venison, above. After dinner and Auld Lang Syne (does anyone else find that song irritating? I can’t stand it!) there was some dancing afterwards of the Dad, or perhaps even Grandad, variety, with music pitched no further along the evolutionary ladder than early Eighties. Not quite Muddy Stilettos’ bag – I like to bust my street moves on unsuspecting strangers – so I sat happily nursing mojitos until the early hours instead. Yesterday was a total wipeout with my hangover. Just a whole lot of Pringles, chocolate and stir crazy children as I lay on the couch quietly moaning. So today is actually my New Year’s Day. So Happy New Year my lovely Stilettoers! I’ll be posting over the next few days, and will be back in action fully once I’ve pushed all my sproglets through the school gates next week.